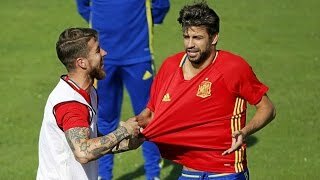 Gerard Pique makes Sergio Ramos and Diego Costa laugh during Spain training | 2017. 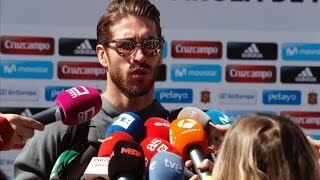 A story about best friends Sergio ramos & Diego costa in Traning Spain. Spain national team getting along just fine, no problems. Ready for match with Israel | 2017. 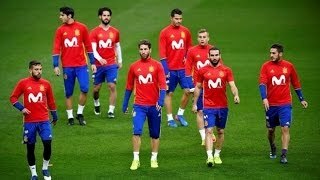 Spain national team having fun during training | 2017. 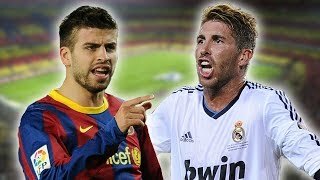 Sergio Ramos, "Pique and I like to throw shots at each other sometimes" says the Real Madrid captain during Spain's training session for Israel match. | 2017. 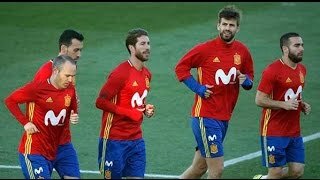 Isco very friendly with Barcelona players during training with Spain national team | 2017. Warming up of the Spain team at the Stadium of France. 1/8th finale. Match Italy vs Spain. Victory from italians 2-0. Goals : Chiellini (33th) Pellé (90th + 1).